Summer, wait for me! I have been so busy the last days, weeks, months, writing about my Bolivian experience, too tired to cook when coming home from work, and actually did not really feel like cooking at all. Does that happen to you from time to time? For some weeks now, I have been alive on basic salads and sandwiches, quick pasta, quiche, or rice recipes. But (and thanks God), last week my sister came to visit me, so I managed to prepare some homemade food which I can really be proud of, not proud of cooking itself but proud of switching to relax mode, close the door of the kitchen and create something with my hands. I also managed to prepare some jams – first ones this year! 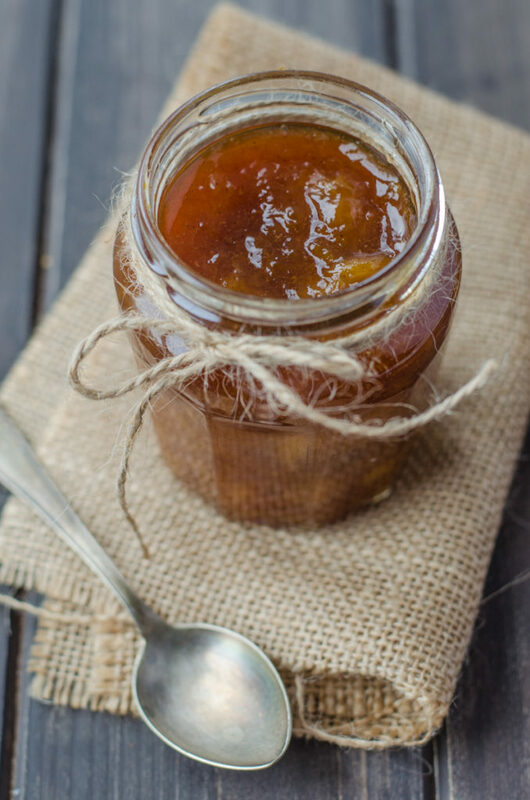 If you had a chance to check my favorite Gourmet Apricot Jam with Vanilla and Almonds, you might have spotted I was talking about other jams in that post. 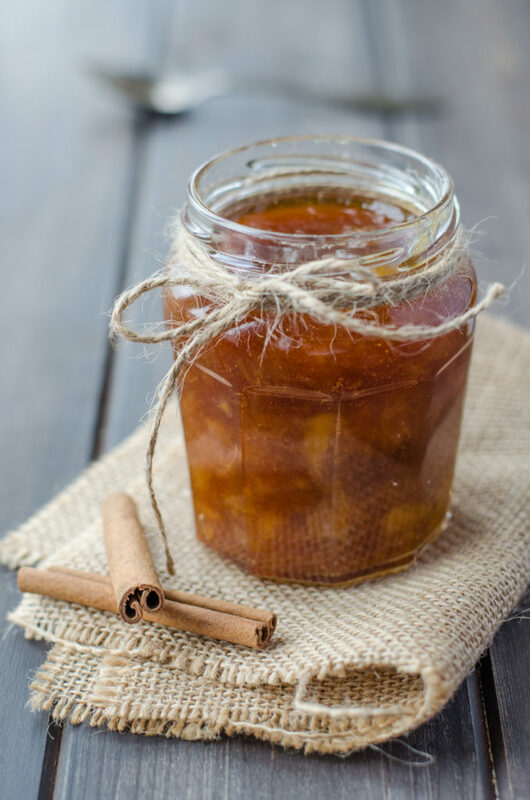 And so here I finally managed to prepare and shoot another one for the blog – a tasty Peach Jam with Cinnamon and Rum, another flavored jam made from summer fruit. The combination of peach and cinnamon accompanied by rum is amazing! This recipe is for 4 jars, but as I love to prepare more different jams, I usually do just 2 jars from the half of the ingredients. The jam is not difficult to prepare, but be aware of the fact that you will need to peel the peaches. The easiest way to do so is to put them in a boiling water for 30 seconds and then cool them down under cold water. Then you can easily take away the skin and cut them into chunks. 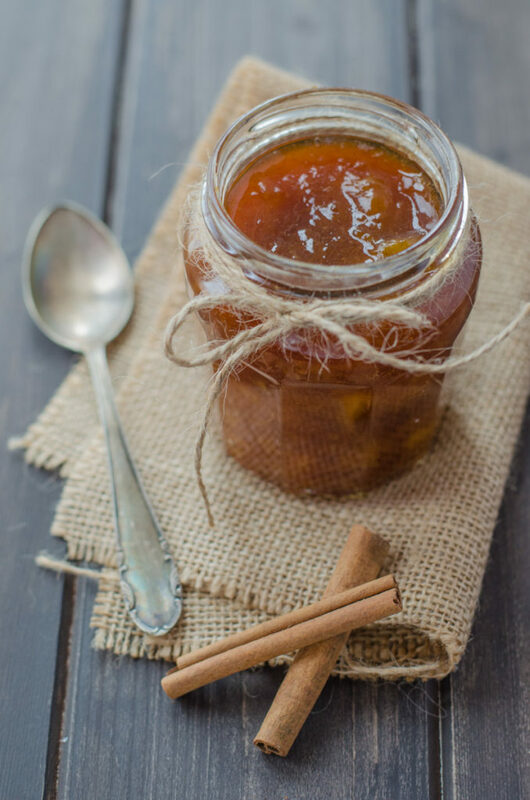 I usually do this Peach Jam with Cinnamon and Rum using the Gelfix 2:1 by Dr. Oetker. This means that for 1 kg peaches I use 500 g sugar. It is important to mention that the method in this recipe considers the use of Gelfix 2:1, but you can use another pectin too, just remember that in that case, you may need to change the method or the dosage of sugar! Put the peaches in a large pot, cover with boiling water for 30 seconds. Take them out and cool down under cold water, peel the skin. Take out the pit and chop them into small pieces. Preheat the oven to 60°C and preheat the clean jars in the oven. Throw the peach chunks into a large cooking pot, add the cinnamon and lemon juice. Bring to boil and boil for 5-10 minutes until the fruit becomes more liquid. Add the Gelfix mixed with 2 tbsp. sugar and bring to boil again. Boil for 1 minute, then mix in the rest of sugar. Boil for another 5-10 minutes (depending on your preferred consistency). Take off the heat and allow to cool down a bit, then stir in the rum. Right after, take the jars out of the oven (if not yet done) and fill them with the jam. Turn the jars upside down for 10 minutes and then store them in a cool place. If you use another kind of pectin than Gelfix 2:1, check the appropirate instructions as you might need to slightly change the method or dose of sugar.